It takes a special property to put the simple pleasures, sweet smells and Southern beauty of Savannah in your bones. On Forsyth Park is that property. It's easy to see why this home is one of the most coveted Savannah vacation rentals once you gaze at its airy layout and sophisticated style. Both the interior and exterior of this home are full of delights. While On Forsyth Park may appear to be just another charming home at first glance, there's more than meets the eye. This is one of the rare vacation rentals in Savannah GA that actually offers a view overlooking Forsyth Park. That means that you'll have around-the-clock views of one of the most famous attractions in all of Savannah when you claim this holiday rental as your own. Are you intrigued by the idea of scooping up one of the best Savannah vacation homes around? Let your mind wander to visions of enjoying mint juleps on your porch after dinner as you take a tour through On Forsyth Park. On Forsyth Park features three bedrooms and two bathrooms. That makes it an ideal place to stay when planning a trip that will include up to eight guests. The home features a lovely front porch that will serve as your personal Southern perch to enjoy when you're in the mood to take in some quaint views and sweet air. Feel free to take off your shoes and sink into the comfortable leather couch inside the living room inside this home. The soothing colors, flat-screen television and fireplace in the room will make you feel right at home. You're sure to love the way the light from the room’s tall windows bounces off its crystal chandelier whenever you take a little time to relax on a sunny afternoon. The living room features a small bar area with a wine fridge. The home's kitchen is directly off of the living room. This kitchen can't be described as anything other than perfectly cute. It features all-white cabinets, new countertops and modern appliances. You can make use of the kitchen's full stove, refrigerator and microwave during your stay. You're sure to find plenty of storage space in the kitchen's lovely cabinets. The kitchen features a dining table that can comfortably accommodate four guests. Guests will find a nook featuring a washer and a dryer in the hallway on their way to the home's bedrooms. Making your way to the home's bedrooms means entering a world of classy comfort. The first bedroom features a bounty of windows and a sunny, spacious atmosphere. There is a flat-screen television positioned across from the room’s cozy iron bed. The room also features a fireplace that will make you feel totally at home. The second bedroom will charm you with its high ceiling, tasteful furnishings and fireplace. This room has been designed with classy, tasteful pieces that create a plush and inviting feeling. The home's third bedroom features two windows and many of the same tasteful accents as the other two bedrooms. All of the bedrooms contain ceiling fans that can help to keep things cool while you're relaxing in a soft, cozy atmosphere. The two bathrooms in the home are fresh and updated. Guests can enjoy features like pedestal sinks and tubs with shower options. Coming to the white covered porch attached to On Forsyth Park is truly the highlight of any tour of the home. This is the perfect place to start each day with your fingers curled around a cup of coffee. You can take in park views from your seat on the porch's lovely patio table. Snagging one of the best Savannah vacation rentals is just the first step to planning an amazing vacation in Savannah. Staying at a home in such a desirable location puts you in the perfect position to map out your daily adventures and make plans to visit all of the top attractions in the city. Of course, you'll already be just steps away from famous Forsyth Park. That means that you can plan to enjoy the park’s famous fountains, gardens and greenery whenever the mood strikes you during your holiday. Be sure to put aside some time to tour the famous Savannah Historic District to see some of the most spectacular residences in the country. You'll also want to visit iconic landmarks like the Cathedral of St. John the Baptist, Bonaventure Cemetery, Lafayette Square, Colonial Park Cemetery and Mercer Williams House Museum. Of course, no trip to Savannah could be complete without devoting some time to checking out the action on River Street. This is where many of the best restaurants, bars, shops and festivals are located in Savannah. Many visitors also have fun experiencing the city's graveyard tours and spooky walking tours at night. Savannah is also one of the best spots in the country when it comes to seasonal festivals. It's important to look for available Savannah vacation homes ahead of time if you'll be attending the Savannah Music Festival, the Annual Tour of Homes and Gardens, the Sidewalk Art Festival, the Savannah Garden Expo, the Savannah Jazz Festival, Fourth of July on the Waterfront or any of the other events happening throughout the year. Put the fun, mystery and Southern charm of Savannah at your fingertips by staying at one of the best Savannah vacation rentals available. On Forsyth Park leads the pack when it comes to convenient and enjoyable Savannah vacation rentals because of its location, views and lovely look. 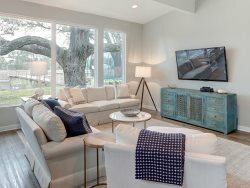 All savvy Savannah visitors know that Savannah vacation homes play a big role in experiencing the city the way it was meant to be experienced. The property was fabulous and although it was street parking, there was never any issues finding a spot. We had the best time and can't wait to return to your beautiful city! We couldn't have been happier with it experience at this place. Anytime we visit Savannah in the future, we will stay at this place granted it's available.